With geometrics right on trend for 2017, we are thrilled to introduce our fabulous Vista range - an eclectic mix of shapes, colours and textures that will truly stimulate your senses. The geometrical patterns and shapes combined with rich tones and contrasting surfaces in this exciting range are a break from the conventional tile patterns and the traditional use of ceramics. Vista takes the simple, everyday shapes of the square and the rectangle and gives them movement through the combination of rhombuses, triangles, and parallelograms. The range features three contrasting surfaces. The elegant and modern Plaster with a soft structure and a glossy shine, Matter, a grainy, opaque, and coarse cement effect tile, suitable for outdoor spaces, and Canvas, which has a 3D textile texture. All three textures are available in six warm and cool tones from bright linen all the way to intense basalt grey. 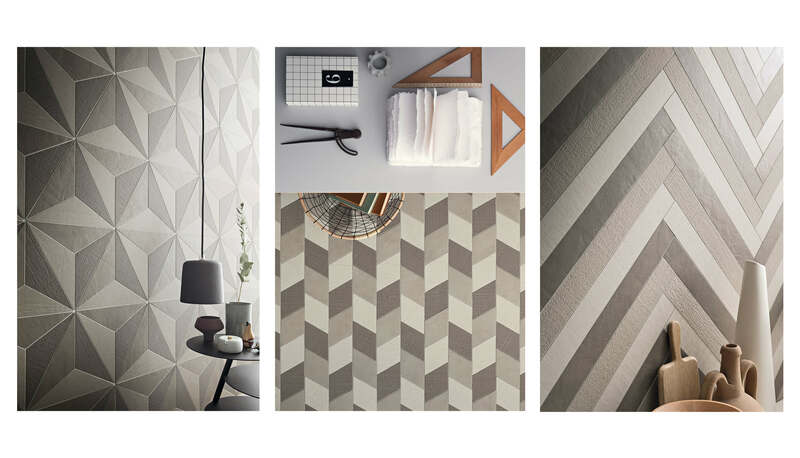 When combined with the nine geometric tile shapes, this range has an incredible versatility with strong contrasts through variations of colour or monochrome surfaces. To order a selection of samples pleae visit the Vista range page.